This years dConstruct conference badge. Photograph: James Box. Earlier this year Christopher Fahey crystallised these thoughts in his post A Book on a Hook in which he demonstrated the badge designed for The Web and Beyond conference in Amsterdam. 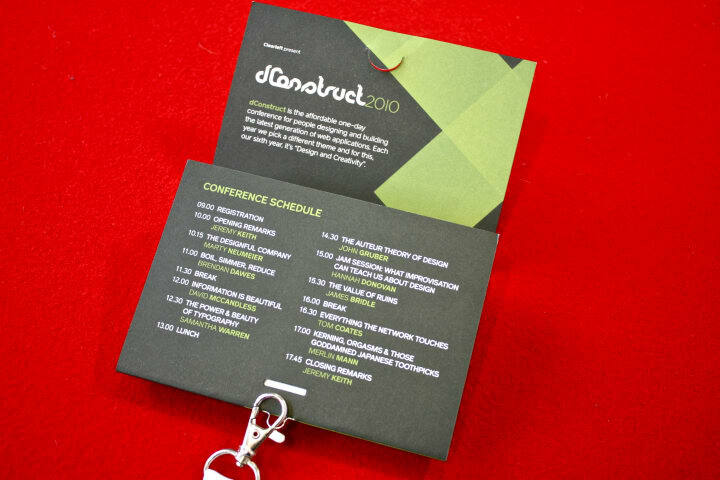 Like previous dConstruct conferences, this design combined the programme and name badge, yet it used loop staples so it could be attached to a lanyard directly. Further still, the contents were printed upside-down so it could be read whilst being worn.